Courtesy image “Taking on Water,” by Wood River Valley resident Wendy Pabich, was recently released by Sasquatch Books. Valley resident Wendy J. Pabich, a longtime advocate of water quality and conservation in south-central Idaho, introduced her new book at The Community Library in Ketchum earlier this month. The book, titled “Taking on Water: How One Water Expert Challenged Her Inner Hypocrite, Reduced Her Water Footprint (Without Sacrificing a Toasty Shower), and Found Nirvana,” found the light of day after publisher Sasquatch Books in Seattle decided Pabich’s intimate investigation of her own consumption and what it means for world water shortages and quality is a fitting treatise as “drought rages through 52 percent of the United States, shriveling crops and shrinking important reservoirs,” according to a publicist’s marketing letter promoting the book. Pabich showed some slides of her Hailey home, one of the water-wasting culprits exposed in her book. She put the home on a water diet since her formerly water-loving yard helped her and her husband, James Foster, use 30,000 gallons in one month, according to an irrigation-season water bill. Pabich said during her lecture that the stunning revelation was particularly embarrassing because she is a water scientist with a Ph.D. from the Massachusetts Institute of Technology, and has spent her life advocating for clean water and conservation. “I am the water diva, for Christ’s sake,” she said. Pabich said that during her youth in New England, she grew up by the sea and imagined herself as a mermaid. Seeing herself as a water-keeper—one who speaks for the fish and such—Pabich explained that to do her best work she must also explore her own failings as a water consumer—thus the birth of the book that does just that and offers tips for how one can improve one’s own use of a resource she described as becoming, if not already well beyond being, more valuable than gold. It is a valid argument when considering growing battles for water around the world today. Pabich read on, describing the “plump, juicy, warm, nectarous treats” in their garden and the climate of her home in Hailey with its short growing season that still produces fantastic tomatoes. 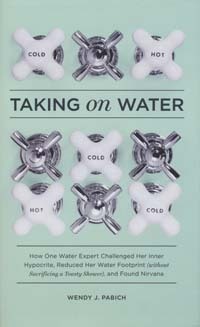 On the first page of the book she quizzes her husband: “How can we be using so much water?” Thus began a year-long saga of trying to answer the question and figure out how to do something about it amid the dizzying mash of calculations and statistics that she had to pour over to make sense of her water reality. She said she hopes that process can become a tool for anyone interested in exploring his or her water footprint and what to do about it if it seems too big. Some of the numbers Pabich shared are astonishing: Leaks in water systems account for one trillion gallons wasted each year in the United States, and installing low-flow toilets nationwide could save 5.4 billion gallons a day. Pabich’s calculations of her own water budget for household use, including products and services, everything from irrigation, teeth brushing, food, shoe and electronics purchases and airline flights, came to a whopping 460 gallons per person per day. Something that shocked her in her investigation was that her dog’s budget was only half that, even though she is a carnivore and it takes a great deal of water to raise meat. To carry out her investigation and begin to make some changes, Pabich installed water meters and clipboards to gather data wherever water entered or exited the property. She showed a picture of Foster showering in a solar shower set up in the yard and an imported paddle valve for shutting off the shower flow while lathering. Many present at the lecture gave Foster pitying looks as they listened to the dire tale of water woe spun by his wife as it was clear that he was an unselfish yet perhaps not always ungrudging participant in Pabich’s domestic experiment. However, shaking up one’s life and that of those around you is part of the tribulation of trying to make a change in the world, Pabich seemed to argue. She did so with a smile and quick wit that seemed to get sharper the closer she got to discussions of protecting water quality, which is perhaps her biggest mission next to conservation. The two go hand in hand, she said, adding that cleaning water is not the ultimate solution because technology does not fix everything. The comment got great guffaws and heaves of disgust from the audience, shortly before Pabich read more from her book and ended her talk with a book signing facilitated by Iconoclast Books. Ketchum City Councilwoman Nina Jonas, who attended Pabich’s lecture, said that water was her No. 1 agenda item for the new year. “My top goal is to explore the energy saving benefits of water conservation,” she said in an interview after the lecture. “Over the past several years, I have been exploring ways to save energy, and therefore money at the utilities plant. Unfortunately, options such as solar panels or biomass generators require substantial infrastructure investments.